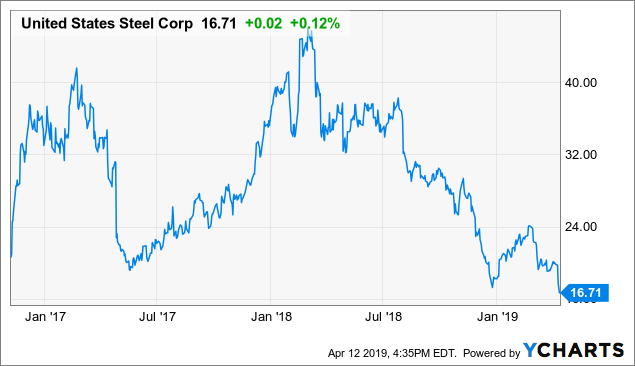 U.S. Steel stock has lost nearly two-thirds of its value since early 2018. Analyst sentiment is getting excessively negative. If you're bullish on the economy, U.S. Steel offers an interesting trading opportunity. In my article highlighting sector returns over an 82-year period up through the mid-2010s, the steel industry came in dead last out of the 30 listed sectors. That probably shouldn't come as a surprise. Steel is a highly competitive industry with little in the way of moats or sustainable advantages for its various players. Add in the flood of foreign competition that sunk the sector in recent decades, and you have a formula for worst-in-the-stock-market performance. Not surprisingly, I'm not real keen on adding U.S. Steel (X) stock to my portfolio of buy and hold picks. But, as a trade, there is some real potential here. Here's a chart of U.S. Steel stock dating back to election night. As you can see, shares launched following Donald Trump's surprise victory, with the share price doubling in a few months. The stock gave back all its gains after it was clear that it would take longer for Trump's economic plans to filter through to various industrial stocks. However, by early 2018, X stock was cooking, as the combination of tax cuts and other stimulatory measures appeared to be ushering in a most favorable operating environment for steelmakers. In addition, Trump pushed through tariffs on imported steel that gave domestic operators a big leg up. But the good times didn't last. Since early 2018, it's been all downhill, however, with the stock dropping from a peak of $45 to $17. It's important to realize that U.S. Steel hasn't been the only stock plummeting in its sector lately. As such, it wouldn't be fair to place the blame for the company's share price on management. For example, AK Steel (AKS) went from $2 to $11 in 2016 but has now given back all the post-Trump gains and more, and is back near its cycle low from the dreary days of winter 2015-6. What's gone wrong? Tariffs have backfired. Tariffs appeared to be a blessing, in that they were allowing producers to charge significantly higher prices. However, the flip side of that is demand. And most signs out of China are looking rather ominous at the moment. The economies in both Europe - where U.S. Steel has major production - and Japan also look shaky for the time being. As it would turn out, the implementation of tariffs just about marked the top in U.S. Steel's stock price. Despite forward earnings estimates steadily shooting up - and then in fact being realized as quarterly results came in - the market gave the company no credit for these surplus earnings. Why's that? Presumably because the market doesn't believe these earnings will last. For one thing, the tariffs may well go away when the U.S. gets around to striking a new trade deal. It appears that some steel from countries subject to tariffs could slip in via trade with countries seeking exemptions such as Canada and Mexico. On top of that, the escalating tariff war is substantially reducing demand for finished goods that involve steel. The economics adage about there being "no such thing as a free lunch" applies here as well. Incredibly, U.S. Steel's earnings per share went from negative in 2016 to $2.19 in 2017 to an amazing $6.25 in 2018. Yet the stock sold for under 5x 2018 earnings for much of last year and is now at under 3x trailing earnings. This leads to a critical point - you can't value hyper-cyclical firms like U.S. Steel purely on trailing earnings. The market is looking ahead and seeing U.S. Steel facing lower demand, lower excess tariff profits, higher costs versus the industry, and an onslaught of new lower-production sources coming online over the next couple of years. These are all fair concerns. On top of that, while U.S. Steel has shored up their balance sheet to some degree, there still are question marks there as well. The company currently has about $1.0 billion in cash on hand, which is a reasonable position. That said, cash plus accounts receivables only adds up to its accounts payables, so the current liquidity position isn't overwhelmingly strong. On top of that, U.S. Steel has $2.3 billion in long-term debt, which is a fairly large chunk compared to the $2.9 billion market cap at the moment. Keep in mind that as recently as 2015 and 2016, U.S. Steel was losing hundreds of millions of dollars a year in net income. So it's important to think about what the balance sheet looks like if you have another steel slump like that. The $1.0 billion in cash wouldn't stretch that far. Additionally, despite strong current profits, U.S. Steel is not building cash reserves, as it is running a higher CAPEX budget at the moment and trying to buy back stock at the same time. There's obvious appeal to buying back stock with shares down ~60% recently, but there's still a line to walk to make sure that the safety of the balance sheet isn't endangered. Recently, Credit Suisse downgraded its price target for the stock to just $13/share. This could be indicative of an analyst call marking the bottom. Bank of America, for what it's worth, laid into the stock as well Thursday with a rare double-downgrade from Buy to Underperform while slashing its price target from $31 to $18. These analysts make credible points about downside risks to X stock. That said, it wouldn't take much to go right for X stock to really pop from here. Keep in mind that the consensus forward P/E ratio is still under 5x. Yes, 2018 was a banner year for steel-making profits and 2019 won't be as good. But it will hardly be a disaster either. When you can earn 20% of your market cap in profits in a single year, that shows the huge amount of leverage in your business model. Yes, that leverage can wipe your business out if the economy craters. But the stock market is back at all-time highs. Some emerging markets are looking healthier. Rumors of an imminent China trade deal keep swirling. It's not hard to think about what could go right for the global economy, and thus for U.S. Steel. My call since last December has been that the recent stock correction was misguided and that our economy will remain strong heading into 2020. The Fed's capitulation away from prior hawkish views only adds to the strength of my bullish conviction for the economy and stock market. With that as my view, I'm inclined to take a favorable outlook for X stock, particularly as analysts are rushing to trash it at the moment. Ultimately, I'm bullish on the economy, and thus it's hard for me to be too bearish on X stock after it has already dropped 60%. Yes, there are some factors that seem negative, such as the auto cycle turning downward which will lead to demand weakness. In the end, though, I expect a trade deal to get done and global demand to pick up. It's hard to be negative on something so levered to the economy, like steel, when the Fed has just pulled a massive U-Turn from tight monetary policy back to neutral in just a few months. It's not hard to imagine X stock rebounding sharply in coming months as we see U.S. industrial activity remain firm - against all the errant recession chatter from earlier this year - along with emerging markets picking up some steam. Throw in all the hyperbolic bank analyst downgrades of late, and you have to wonder who is left to sell the stock and/or turn more negative on its shares. Conditions are ripe for a sizable bounce in U.S. Steel stock. It's worth remembering that U.S. Steel stock traded for $40 in 2014 at the height of the previous upswing in global growth. Then as China concerns mounted in 2015, X stock plummeted. It finally bottomed at $8. X stock then recovered to $20 even before Trump won, and quickly doubled again after that. Since then, U.S. Steel has strengthened its balance sheet, so it probably shouldn't revisit $8. That said, keep in mind this stock is highly volatile, it can drop farther than you expect in the short run. When things turn up, however, the recovery could run quite a ways. This is an excerpt of an Ian's Insider Corner report published last Friday for our service's subscribers covering five stocks making new 52-week lows. If you enjoyed this, consider our service to enjoy real-time access to all our analysis. Membership also includes an active chat room, weekly updates, and my responses to your questions.